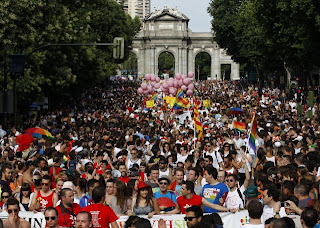 Today at 6pm starts Madrid’s 2013 Gay Pride Parade! The annual, blockbuster “Orgullo Gay” event is a Gay-Pride Celebration, attended by Gays & Straights alike, and one of the biggest in all of Europe and definitely the biggests in Spain. In a nutshell, the Gay Pride Parade is a big street party with lots of ab-ripped, sweaty guys on double-decker buses passing every 30-minutes, “regular looking” people marching down the street with banners, and about a million spectators trying to catch a glimpse of the parade, trying not to spill their beer, and trying not to need to use a toilet – because there are few-to-none. This year, for unknown reasons to me, they’ve changed the parade route from the traditional to the (nearly) absurb. 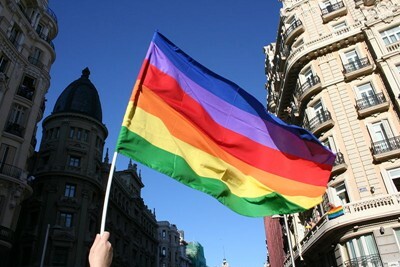 The 2013 Gay Pride Parade in Madrid will start at/near the Atocha Train Station, move northbound up the tree-lined Paseo del Prado, turn right at the Plaza de Cibeles to the Calle de Alcalá, and end at the Puerta de Alcalá. As long as I can remember, the Gay Pride Parade route started at the Puerta de Alcalá, passed through the Plaza de Cibeles, went up the Calle de Alcalá, and then along the VERY wide Gran Vía Boulevard. Maybe they’re testing new routes for future Gay Pride Parades, I don’t know, but I can’t think of a less-logical route utilizing the Paseo del Prado. Sure, it’s a long, straight boulevard, but it has 4 lanes on each side of a tree-lined green space in between and somewhat rather narrow sidewalks. On the western edge of the Paseo del Prado boulevard you have tall buildings right up againsts the street. On the eastern edge of the boulevard you have fences. 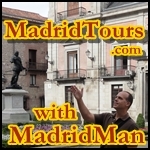 I can’t imagine how people will be able to get close enough to see anything if they’re not at either Atocha, Cibeles, OR at the Puerta de Alcalá – and these three locations are HUGE. Fill those locations with tens of thousands of people and you won’t be able to see much there either if you don’t get there early. I think going down the Paseo de la Castellana is a much more logical route. The parade starts at 6pm, but it travels at a snail’s pace. I don’t expect the last “carroza” (“float”) will start up the Paseo del Prado until 9pm. The first groups in the parade are always the most mundane and are usually small groups of LGBT associations holding banners and wearing street clothes with no flash whatsoever. I know, they don’t HAVE to be flashy, they just have to be themselves – and that’s what it’s all about. The most “fun” floats, however, come towards the end of the parade with groups of big, buff, ripped male bodies standing atop double-decker, open-top buses, waving and dancing to loud disco music. To be honest, in the 3 times I’ve seen the Gay Pride Parade in Madrid I’ve NEVER seen these double-decker buses. I never could wait around long enough in the heat to see them. And who (not me, sure, but many will) wants to stand under the hot sun among thousands of sweaty people? I know a lot of people can put up with it, but as some of you might know, “MadridMan is a Hot Body“, and hates the heat. But that’s life – and I expect to be accepted for who I am, just like anyone. Previous Year’s Postings: “Orgullo Gay Madrid Gay Pride 2009” & “2011 Madrid Gay Pride Parade: Not Just For Gays“. 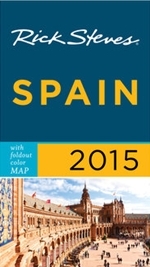 This entry was posted in About Spain, Entertainment and tagged 2013, atocha, Calle de Alcala, Carrozas, desfile, gay, gay parade, Gay Pride, heat, hot, Madrid, orgullo, Orgullo Gay, parade, Paseo del Prado, Pride, Puerta de Alcala. Bookmark the permalink.